You haven’t heard much from me these last few months because I’ve been feeling de-pleated by condo board responsibilities. Small problems were looking big, and bigger problems looked overwhelming. Time to hit the reset button, so I headed down to Bee Heaven a couple weeks ago to get some much needed farm therapy. Fall is planting time down in Redland. Summer is just too hot, too buggy and too rainy to grow much of anything. 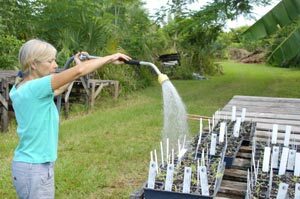 Planting starts in the fall near the start of the dry season, and harvest is in the spring. The growing seasons here are completely upside down compared to the temperate climate Up North. Jane transplanted starts into their first pot. It was a sunny, breezy Saturday afternoon when I visited Bee Heaven. Margie and her manager Jane Cameron were puttering in the potting shed, transplanting starts, or baby vegetable plants, from the seed beds to small pots. A bit of soil went into the bottom of each pot. Then, one by one, Jane carefully lifted each start out of its bed and placed it into its new home. She set the plant down with one hand, put more soil around it with her other hand, and pressed the soil down gently. The work had a gentle rhythm. Repeat it a hundred more times or so, and that was the afternoon’s task. You’re not thinking of bugs, or disease or freeze — although those risks are there, even at that stage. Some starts’ leaves had evidence of bugs munching along the edges. Another start revealed a small black caterpillar near its roots, as it was gently lifted out of the seed bed. The caterpillar would grow up to be a butterfly of some kind, Margie explained, but in the meantime, it was chomping on little roots. A note was made in the input log, and the plants and seed tray would be treated with BT for the caterpillars. Jane watered the starts after transplanting. Labels were placed into the pots, so you knew what kind of plant it was. Trays of pots were taken to an outside table made from old wooden pallets, where the starts soaked up sunshine and would grow and grow. Jane watered them lightly, holding the spray nozzle high above, so water fell gently like rain. Smaller starts were waiting on other outside tables nearby, still too young for transplant, maybe in a few more days. “They aren’t finished sprouting,” Margie said. When the little plants show four true leaves, then they are ready to pot up. Most of the starts I saw that day were heirloom tomatoes with exotic names like Black From Tula, Red Calabash, and Zapotec Pleated. “ZAP-otec. That sounds like the name of a pharmaceutical,” Jane remarked. “Feeling de-pleated? Try Zapotec,” Margie chimed in. 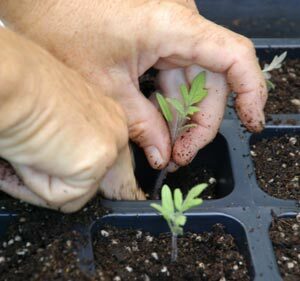 “It will pleat you back in no time!” Now there’s an idea — plant (and eat) heirloom tomatoes to be re-plete with energy. Work done, I ambled around Bee Heaven to see how other things were going. Bright sunshine and clear blue sky were good medicine in itself, and soon I was feeling less de-pleated. A light breeze ruffled leaves, and mockingbirds twittered background music from a nearby big tree and from the hedges further over. Roosters living in nearby chicken tractors got a call and response chorus going. “Ur-ur-ER-ah,” one rooster called, and another responded an similar way, and another, and suddenly I was in the midst of poultry opera. “Here I am, how are you,” they seemed to be calling. “I am here,” I told them. (Yes, I talk to chickens.) I am here, I am fine, pleated and replete. Farm therapy works!